Your new home beckons from the famed International Tower located along the exclusive Ocean Blvd. strip!This mid century marvel complex has been featured in many Hollywood films and is iconic piece of the rejuvenated Downtown area.This stunning and rarely available 24th floor amazing view residence offers many fantastic upgrades including: remodeled bathrooms along with gorgeous wood floors,inside washer/dryer and more!Enjoy your unobstructed forever and panoramic city,ocean,Catalina Island and Queen Mary views all the way from Palos Verdes to Newport Beach from any of the rooms which offer floor to ceiling windows in this home or also enjoy the sights from your full wrap around balcony!There is truly nothing like in the area and this location within the complex is highly sought after and rarely available.The recently remodeled lobby,common areas,gym and pool deck areas highlight the mid-century charm this complex has to offer!24 hr security guard,gym,pool,Rec. 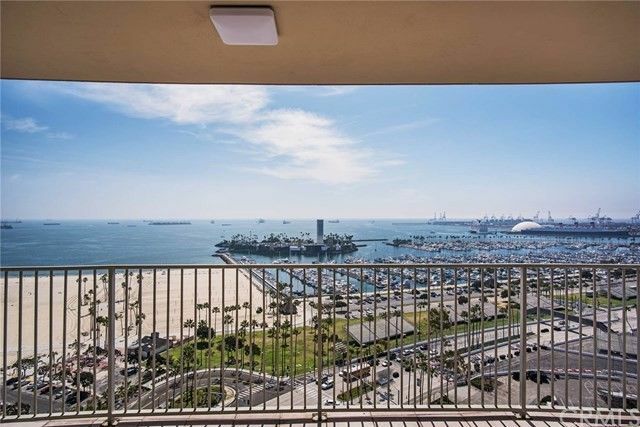 room,onsite management,meeting room and more!This amazing home can come fully furnished with decorator touches and professionally designed interior if desired.This is truly encompassing the best of the Ocean Blvd. lifestyle at an amazing value!This open 2 bed,2bath plan is terrific for entertaining and is sure to impress and has 3 parking spaces!VA and FHA loans approved!! !